Trust DEFENDER® to make thieves and vandals think twice about approaching your property. This sleek dome camera provides a high quality, discrete security solution for your home or business. 800TVL deliver clear, ultra hi-res video for maximum indoor and outdoor surveillance visibility. 24IR LEDs allow for 75 feet of automatic night vision, while the weather-resistant aluminum casing ensures your cameras can withstand harsh elements. Versatile enough to monitor both indoor and outdoor locations, pair DEFENDER® dome cameras with our outdoor bullet cameras for a higher quality theft deterrent and added peace of mind. You’ll always know exactly what’s happening on your property – inside and out. Experience high-resolution, low-light performance in zero illumination from up to 110ft from the camera’s position. The PRO camera automatically activates infrared illumination with 38IR LEDs allowing for clear identification of objects in complete darkness. 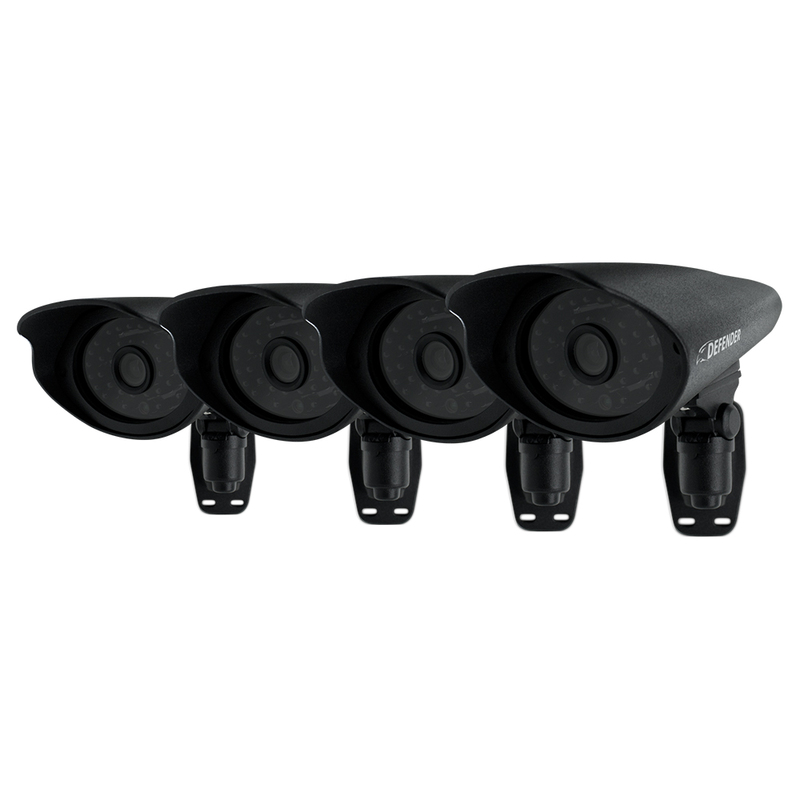 Ruggedly designed for outdoor operation, the anodized aluminum PRO cameras have an IP65 rating. An Ingress Protection rating of 65 means the camera is constructed to be completely protected from dust and typical adverse rain conditions. A sleek sunshade also protects the camera from additional glare that can affect the quality of the image. IR illumination range up to 110ft under ideal conditions. Objects at or beyond this range may be partially or completely obscured, depending on the camera application. Defender highly recommends the use of an Uninterruptible Power Supply (UPS) with surge protection for all products. Although the cameras are weather resistant, they are not weatherproof. Not for use in direct exposure to water, rain or snow. DEFENDER® does not endorse any DEFENDER® products for illegal activities. DEFENDER® is not responsible or liable in any way for any damage, vandalism, theft or any other action that may occur while a DEFENDER® product is in use by the purchaser. ©2013 DEFENDER®. All rights reserved. DEFENDER®, the DEFENDER®, logo and other DEFENDER® marks may be registered. All other Trademarks are the property of their respective owners. 9.1" X 4.1" X 2.5"
These cameras, along with the DVR, are easy to install and use. When you need to search for a recorded event, it is not only simple, you can customize the playback to include the cameras you want as well as slow down or speed up the playback. The quality of the video is good. I have had this system for my business with 4 cameras for over 2 years now and just recently added the 4 new cameras. I am happy with it and highly recommend it. I Installed these cameras myself at the age of 53 and they work great.The Strangest thing is one of these cameras has drawn the attention of a spider and her web. A clear dome covering might help don't no,maybe.The system is otherwise a great system both day and night ,stormy weather and all.I would recommend this around their home and property . Caught a thief in 3 days! Just days after I set up my system I caught a mail thief stealing mail right off my front porch. I contacted the US postal inspectors and they took photos of my video and a copy of my video to track the guy down. Added these to my system and relocated some wireless cameras out to more remote locations of my property. Easy install great quality highly recommend. Easy to set up and adjust features. I bought a system about a year ago with 6 cameras and needed to replace 2 and add 2 extras. System is working great and has paid for itself with 1 time of catching thieves steal a vehicle. Easy to hang on walls but need alot of computer assistance. I have had some other cameras that kept going out on me. So I bought these because of the warranty. So far these cameras have been better quality than my last ones and have worked great for a week so far. I bought this set since April of 2014 and they look great all around day and night , the night vision is real clear , I don't have any complaint on them. The camera color quality is better than our High Def television. It is easy to install and maintenance free. Excellent cameras. All metal construction. Cannot mount from top down, must mount on wall. Field of view seem to be a little narrow. Picture quality is crisp and clear. Installed the cameras a few days ago and they are amazing. Picture quality is great and the price is right! I bought this camera to great better night vison. Works great, filling more secure. I bought a 8 channel DVR system w/(4) cameras through Home Depot. Very easy to install cameras, run the wires, and view on a TV or Monitor. Programming my router and laptop for online viewing was kind of a challenge. Tablet and Smartphone were much easier. I feel the whole system is worth the price I paid and the effort needed to get it working bug free.